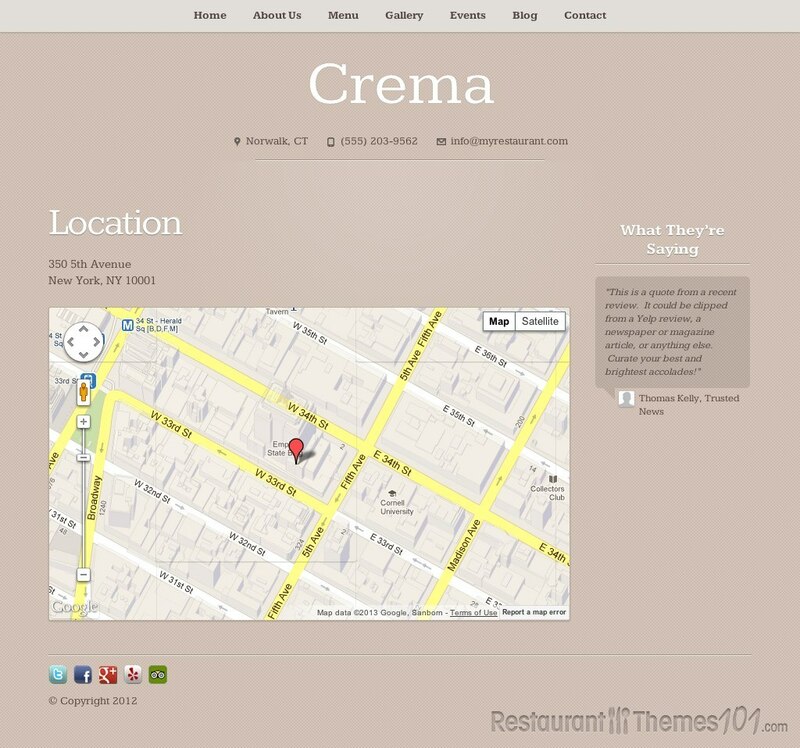 Crema is a WordPress restaurant theme developed by Restaurant Engine. 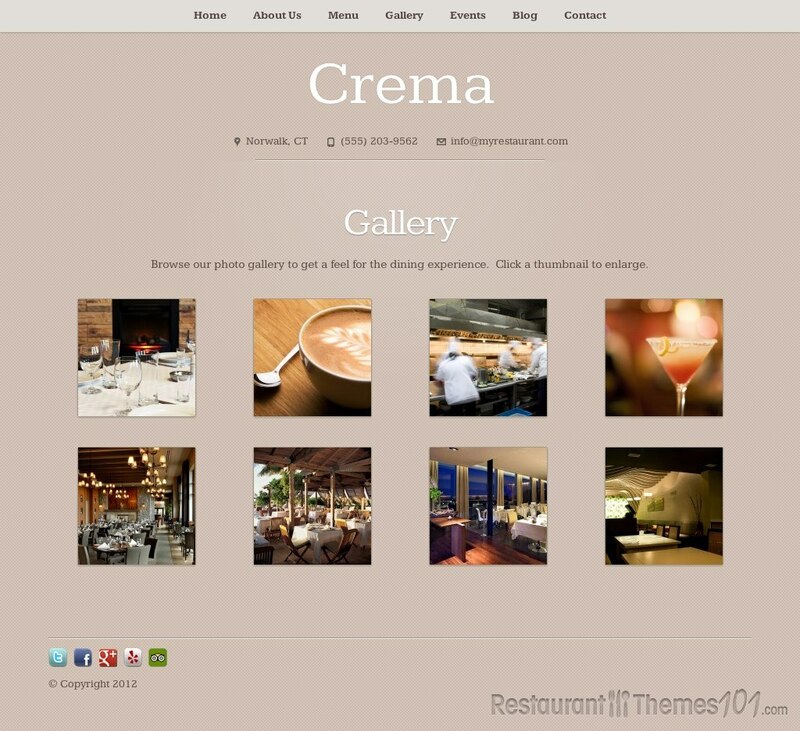 It is a simple and very cute, crisp theme that will work just perfect for your café, coffeehouse or pastry shop, but the theme is very customizable and versatile so it can work just as well for any other restaurant-related business you might be running. It will fit any kind of establishment perfectly as long as you have a sophisticated taste and want to present your business in a warm, welcoming way to your visitors. 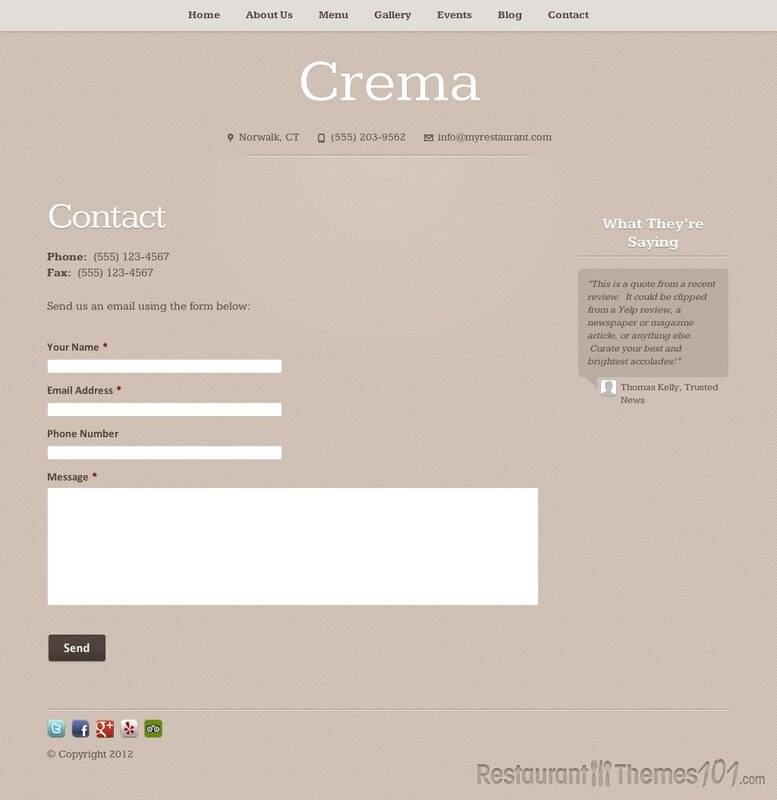 Crema has a very customizable design, allowing you to use your own restaurant logo, change the color styles of the whole theme with endless color combination possibilities, change the fonts to fit your own taste and load your own photos to make your theme as personal and unique as possible. 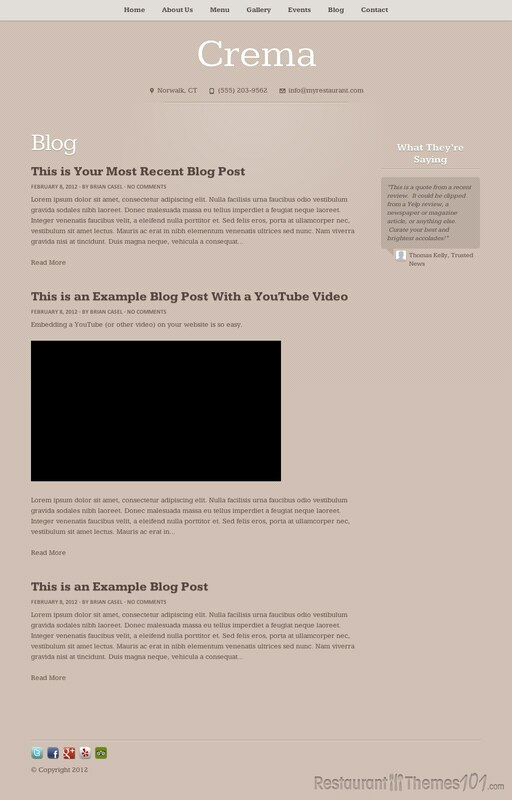 This theme is fully responsive so you don’t have to worry about things looking funky when viewed from various devices. It will look compact and perfect no matter if you are viewing it from a PC, iPhone, a tablet or any other device. 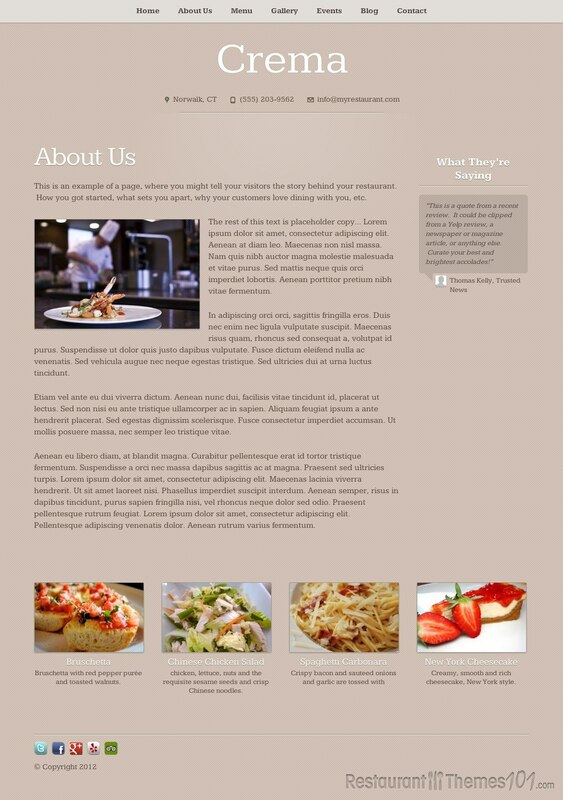 Not only does it look crisp, fresh and welcoming, this theme also offers many useful tools to help you present your business in a nice, warming way. 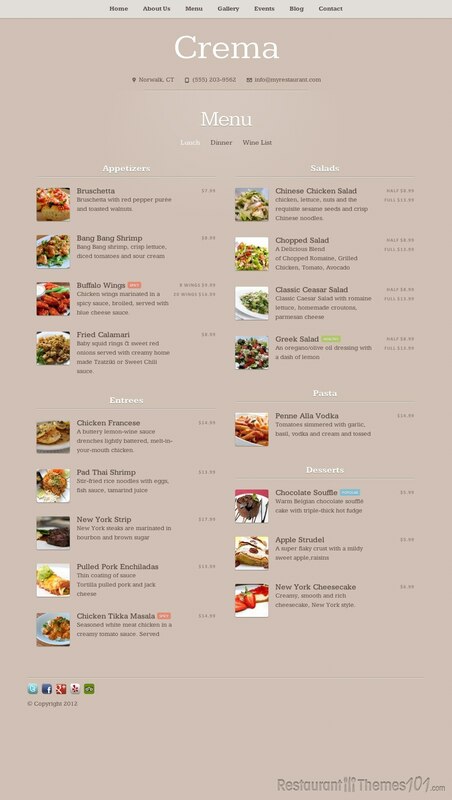 The online menus are very professionally built; you can keep your online menu updated at all times with your own photos, categories, prices, special offers, etc. 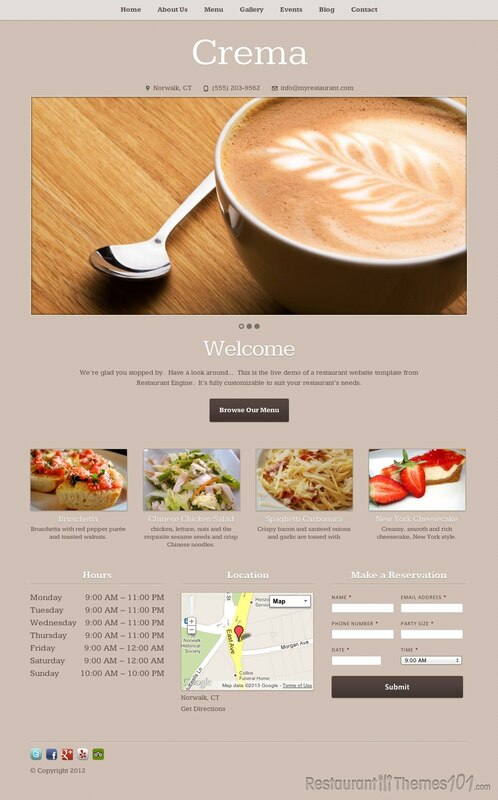 One of the special options this theme offers is allowing your customers to make their reservations very easily right there on your website using a simple built in Online Reservations form that looks good and is very user friendly just like the rest of the theme. Another important breakthrough when it comes to restaurant themes is the Events Calendar where you can announce any upcoming events along with your own photos, videos, dates, maps and many more. You can also have full control of your reviews and you can quote the ones you like the best and present them to your new visitors so they can have the social proof they sometimes need. 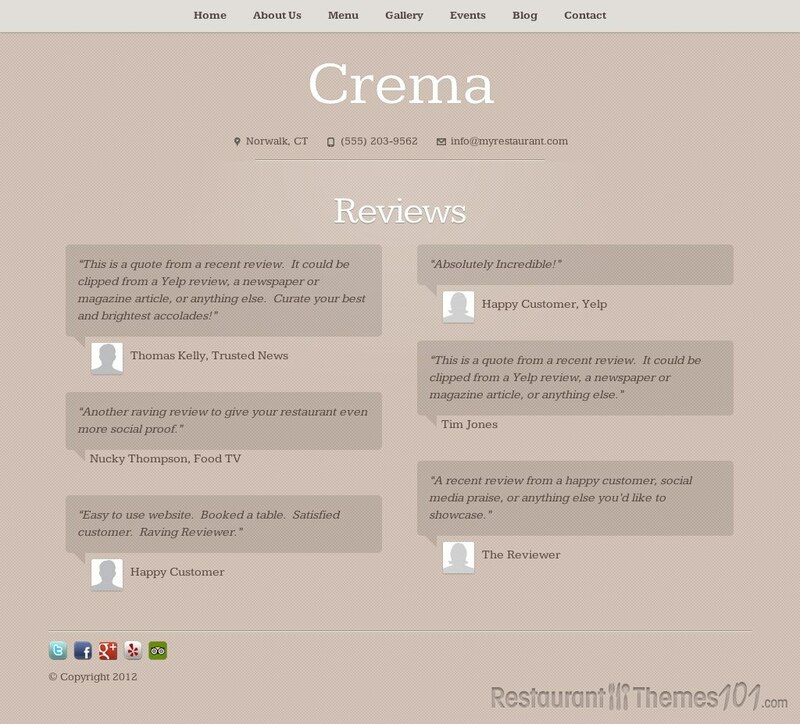 When it comes to social sharing, this theme doesn’t only feature Twitter & Facebook, but also FourSquare and Yelp, which can’t be found in most other themes. Along with built in widgets, social sharing buttons, full SEO optimization, Google Maps integration, great photo and video galleries, this theme offers a special welcoming touch all your visitors are going to love.